One thing kept coming up time and again while I was actively researching the Thomas Henderson saga for Timber's Fortune, a particular challenge, of sorts, laid down by West Auckland local historian, Ben Copedo: where is Thomas Henderson's will? I had no idea. Normal avenues like the probates collection at Archives New Zealand came up duck's egg. 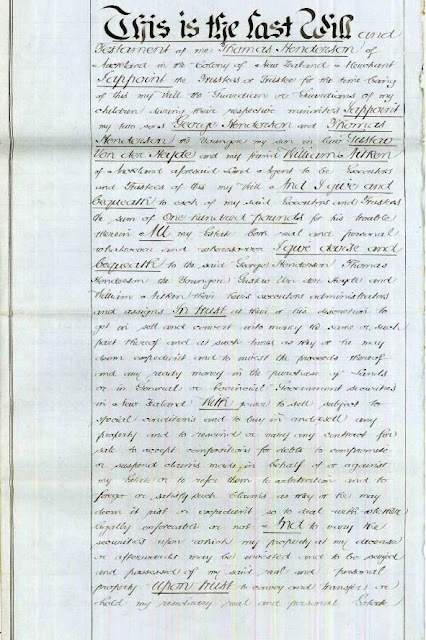 There was a will in Wellington office for a Thomas Henderson dated 1892 (just in case the probate was late, as the Thomas I was looking for died in 1886), but -- no. 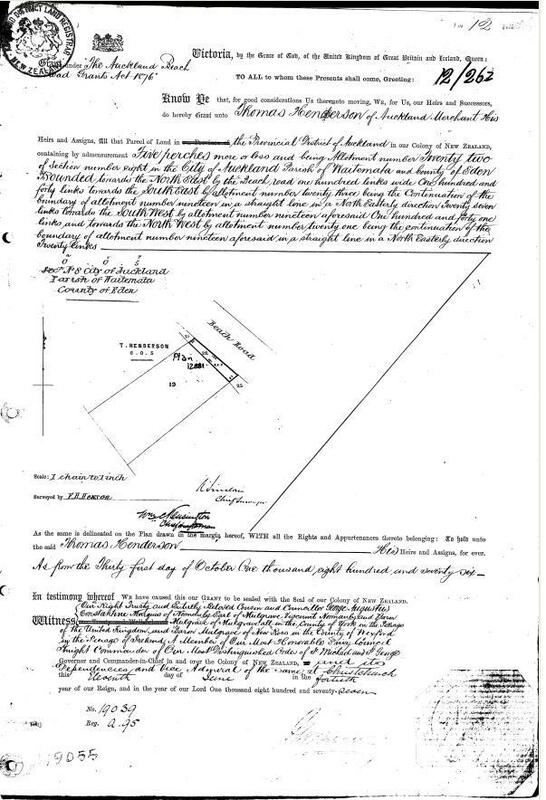 With someone else already laying claim to title before Thomas Henderson's decease, there's therefore no copy of a will written into the deeds books for example. Certainly, he probably did have land elsewhere, I thought -- but that would be like looking for the needle in the proverbial. It could have been Wellington, or anywhere. The breakthrough actually happened much closer to home. 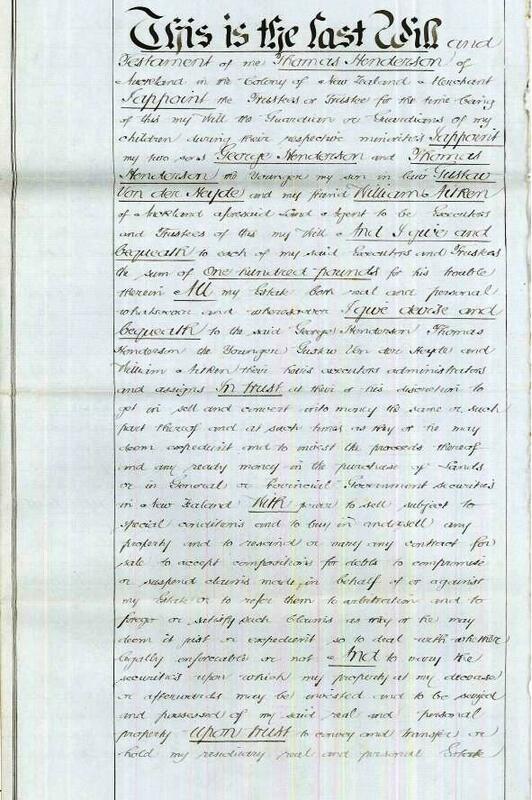 Back in 1852, the Crown Grantee Shortland transferred Lot 19 of Section 8 of the City of Auckland to flour miller Henry Dangar. This site, on the other side of Wynyard Pier from Carr's Platform, may well have been that of the steam flour mill Dangar operated. In 1862, however, he transferred the land to ... Henderson & Macfarlane (Deed Index 1A.96) Now, I can't remember what put me onto this in the first place, but -- while the Bank of New Zealand and their Assets Realisation Board got control of Lot 19, a sliver of land in front on the seaward side, just 5 perches, was surveyed as a result of Beach Road going through, numbered 22, and Thomas Henderson received title in 1876 (title NA 12.246 above). And, somehow -- that sliver of land, in Thomas Henderson's own name, not that of the company, escaped the bank's claims. Reference to a will! I'd been contacted recently by a Macfarlane descendant who asked about Henderson's will. I said none had been found, but -- that transmission reference was my last slender hope. So -- I ordered the transmission file from Land Information New Zealand. I received the file electronically today. That last slender hope paid off. Made out in 1872, Thomas Henderson's last known will, (.pdf copy) providing a legacy for his second wife Emma, his children, and any grandchildren. 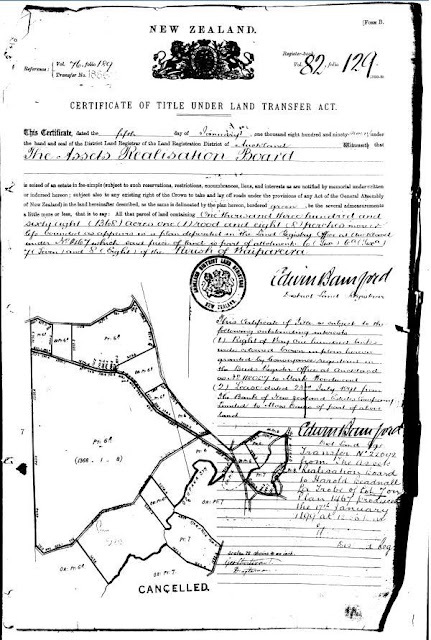 Thomas Henderson Jr. used it as proof of transmission of the Beach Road property to his name in 1891 -- the bank already claiming title in 1890. In terms of trying to track the will down, then -- I reckon I was lucky the bank hadn't quite caught up with Mr Henderson before he breathed his last. I've passed on the info to the West Auckland Historical Society today.